Rating: 5/5 Excellent solid design - Tools included - Great price August 3, 2018 The data doubler is a excellent solid design with all the Tools included in the box at a Great price. My computer is transformed. I work on location and need a second Hard Drive at all times now my second drive is inside the computer and works at blazing fast speeds. No more worrying about someone knocking the external drives cable out. Great price, an outstanding value. OWC offers easy to follow video directions for every model mac the data doubler works with. Rating: 5/5 just what the doctor ordered April 4, 2018 This data doubler works perfectly and I now have the storage I need on my Macbook Pro. Rating: 5/5 Mostly smooth installation, but high quality product March 15, 2018 About the only issue I had with this was getting the drive installed to the bracket in such a way that didn't make it feel like I was going to snap the SATA connector in the process. It's made out of actual metal which was surprising and considering the design of the machine it's going it, it makes sense for heat dissipation. The instruction book (while missing a tiny step) was outstanding as it was a full color product covering All possible installations. Between that and the metal, this was probably where the cost came from. I didn't use the tools included, but they appeared to fit. Rating: 5/5 Easily Installed in a MacBook 5.1 March 5, 2018 Easily installed in my MacBook 5.1 running elementaryOS/Linux. It's a nice use for the space in my unit once occupied by a working optical drive. It's great to have all kinds of room on a very reliable spinning disc for redundant backups from my boot SSD, it (along with elementaryOS) gives new life to a piece of great hardware...that my eight-year-old can take advantage of. Rating: 5/5 Good January 18, 2018 Everything went together perfectly and my MacBook pro mid 2012 is very fast. Rating: 5/5 Well-made and easy to install December 28, 2017 I found the DataDoubler to be a well-made and easy to install solution when I decided to replace my optical drive with a 2nd HD in my macbook pro. Rating: 5/5 The best designed and built product of its kind December 16, 2017 I have seen about a dozen similar products, and this one is the best designed and built of them all: slim yet sturdy, very solid and easy to install. The design is efficient: there is no component or material bulk that would not be needed in the product. This is particularly appreciated by those whose fingers have thickened with age and sports. Rating: 5/5 Great product December 6, 2017 Wasn’t sure at first if it would fit my Mac book I have the 13 inch early 2009 version and the instructions didn’t show how to take mine apart. So I looked it up on the internet and was able to find instructions on how to take mine apart. So I was able to put it in my Mac and it works great. 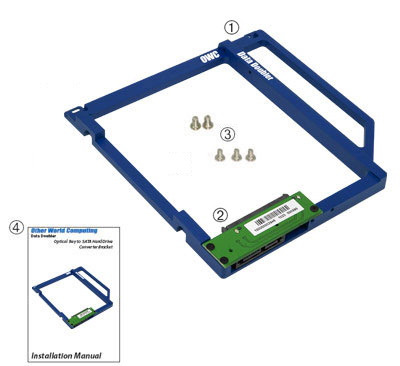 Rating: 5/5 OWC Data Doubler Optical Bay Hard Drive/SSD Mounting November 26, 2017 I ordered this product along with an OWC Multi-Mount: 2.5" to 3.5" (x2) and 3.5" to 5.25" bracket and cable set to upgrade my 2011, 17" MacBook Pro and my 2012, MacPro. The quality of these products is exceptional and the online videos, make installation a cinche. I've had prior experience with MacSales and was quite impressed with their after-sale service. They have always gone out of their way to insure that the products I purchased were of the highest quality and ultimately served my purpose. MacSales is on the top of my Goto list for computer upgrades. Rating: 5/5 No more things needed! October 30, 2017 The kit is very complete, obviously , we need a hard disk to make the kit usefull. 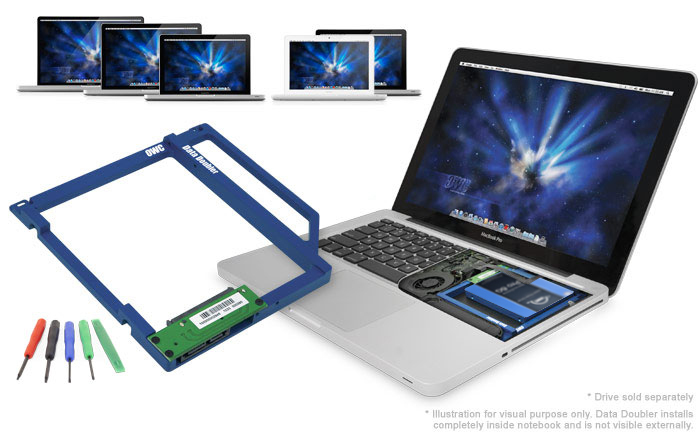 Rating: 5/5 This product is awesome I now have two hard drives in my MacBook October 18, 2017 The data doubler was a good purchase in my MacBook mid 2012 just have to say one thing the tools that came with it are very cheap and broke first time I use the Phillips screwdriver which was annoying apart from that very happy thanks OWC. Rating: 5/5 Excellent! July 5, 2017 In all regards my experience with OWC has been outstanding. The ease with which I can select the correct products to the promptness of delivery. I won't be shopping anywhere else! Rating: 5/5 This product was relatively easy to install. June 28, 2017 If undertaken with care removal of the optical drive and installation of the Data Doubler is a relatively straightforward task. There is, however, one issue. For a mid 2010 MBP the printed installation manual, in section 3.11 part 3, describes the removal of the 'silver' cable situated between the two ribbon cables while the online video makes no mention of this cable or its removal. I followed the vide rather than the manual and found it unnecessary to remove this cable. Rating: 4/5 Great Value June 19, 2017 My DVD drive was no longer working and I had recently upgraded my 750GB HDD with an SSD. I was using the HDD with the external enclosure included in my SSD upgrade kit but it still wasn't as convenient as an internal drive. I went ahead and ordered the Data Doubler which has worked out great. My Mac immediately recognized the drive. The install was a bit more complicated than I had thought it might be. You have to remove quite a few screws and connectors (tools included). About halfway through I thought I had bit off more than I could chew but I powered through with great results. No regrets now that it is done. Rating: 5/5 MacSales/OWC ARE Awesome!!! April 28, 2017 Once again, these guys have proven themselves to be masters at what they do. I highly recommend this company and their products for anyone wanting to buy replacement and updrade parts for their Apple products. And the icing on the cake? : Even with standard USPS shipping, my order arrived within 3 days - way before the 7-10 days! I'm extremely pleased. Can't praise these guys enough! Rating: 5/5 Works great. April 6, 2017 Tip: careful with some of the screws in the laptop, they can be stripped pretty easily. 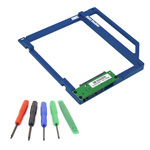 Rating: 5/5 Data doubler for MacBook Pro A1278 March 23, 2017 High quality product! Durable and light! Comes with all tools and instructions that are needed to install and video of the installation is provided. 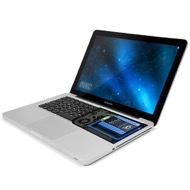 Add a bit of weight to the laptop with the HDD. Rating: 5/5 Provided installation booklet makes installation process straight-forward March 19, 2017 I was ordering some new RAM and an SSD for my MBP 6,1 and decided to also get the data doubler as my optical drive was broken any way. By carefully following the instructions in the booklet that comes with the OWC data doubler, the installation process was very smooth and painless. The data doubler is working great so far, the HDD automatically mounts as a second drive in macOS and read/write operations work just fine. I haven't formatted the original HDD yet, so I can even boot to my old OSX install if I need to. Rating: 5/5 Great Idea January 16, 2017 I have Updated 2 of my MBP's with these and also SSD's from OWC. These are easy to use, and fit perfect. It's a NO Brainer if you want to Upgrade.